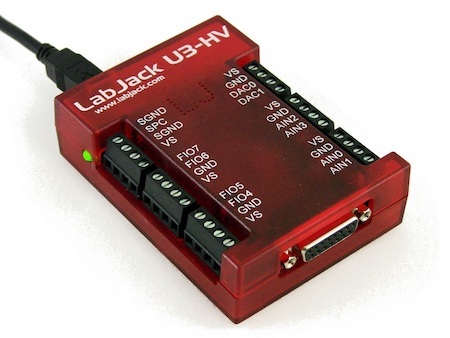 The U3-HV is a USB Multifunction Data Acquisition device with 4 dedicated high-voltage analog inputs, 12 flexible I/O, and 4 dedicated digital I/O channels. The flexible I/O can be configured as either digital or analog, thus providing up to 16 analog inputs, or up to 16 digital I/O. It also has two 10-bit analog outputs, up to 2 counters, and up to 2 timers. The first 4 I/O lines are dedicated high-voltage analog inputs. The remaining 12 I/O lines (FIO and EIO ports) can be individually configured as digital input, digital output, or analog input. In addition, up to 2 of these lines can be configured as timers, and up to 2 of these lines can be configured as counters. The first 8 I/O lines (FIO0-FIO7) appear on built-in screw terminals. The other 8 flexible I/O lines (EIO0-EIO7) are available on the DB15 connector. The LabJack U3 has up to 16 analog inputs available on the flexible I/O lines. Single-ended measurements can be taken of any line compared to ground, or differential measurements can be taken of any line to any other line. Analog input resolution is 12-bits. On the U3-HV, the input range of the 4 dedicated high-voltage analog input channels is ±10 volts or -10/+20 volts. The range of the remaining 12 flexible I/O inputs is typically 0-2.4 volts or 0-3.6 volts, and the range of differential analog inputs is typically ±2.4 volts (pseudobipolar only). For valid measurements, the voltage on every analog input pin, with respect to ground, must be within -0.3 to +3.6 volts. Command/response (software timed) analog input reads typically take 0.6-4.0 ms depending on the number of channels and communication configuration. Hardware timed input streaming has a maximum rate that varies with resolution from 2.5 ksamples/s at 12-bits to 50 ksamples/s at about 10-bits. 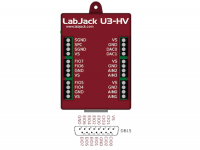 The LabJack U3 has 2 analog outputs (DAC0 and DAC1) that are available on the screw terminals. 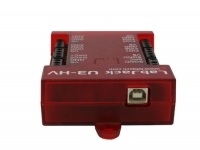 Each analog output can be set to a voltage between 0 and 5 volts with 10-bits of resolution. The analog outputs are updated in command/response mode, with a typical update time of 0.6-4.0 ms depending on communication configuration. The analog outputs have filters with a 3 dB cutoff around 16 Hz, limiting the frequency of output waveforms to less than that. Command/response (software timed) reads/writes typically take 0.6-4.0 ms depending on communication configuration. The first 16 digital inputs can also be read in a hardware timed input stream where all 16 inputs count as a single stream channel. Up to 2 flexible I/O lines can be configured as timers. The timers are veryvflexible, providing options such as PWM output, pulse/period timing, pulse counting, and quadrature input. All I/O lines on the U3 are protected against minor overvoltages. The FIO lines can withstand continuous voltages of up to ±10 volts, while the EIO/CIO lines withstand continuous voltages of up to ±6 volts. 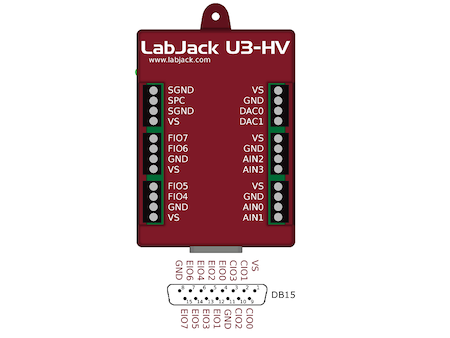 LabJack U3s and U12s are the only USB analog to digital converters recognised by Radio-Sky Pipe II, the strip chart recorder and data logging software published by Jim Sky, which is widely used by amateur radio astronomers. A typical setup is shown below where the LabJack U3 converts the analog voltage output from a UKRAA VLF Receiver to a digital signal which can be displayed on a Radio-Sky Pipe strip chart. As the professional version of Radio-Sky Pipe can log up to 8 channels of data, a variety of instruments can be fed though a single LabJack U3 and logged in Radio-Sky Pipe. Please click here for the LabJack Datasheet and application notes. The UKRAA Very Low Frequency (VLF) Receiver is designed to record Sudden Ionospheric Disturbance (SIDs) induced by solar flares.